These three books were kindly sent to me by the publishers, Orion, as requested by the author, Victoria Eveleigh, after I recently read and reviewed her standalone title, A Stallion Called Midnight. 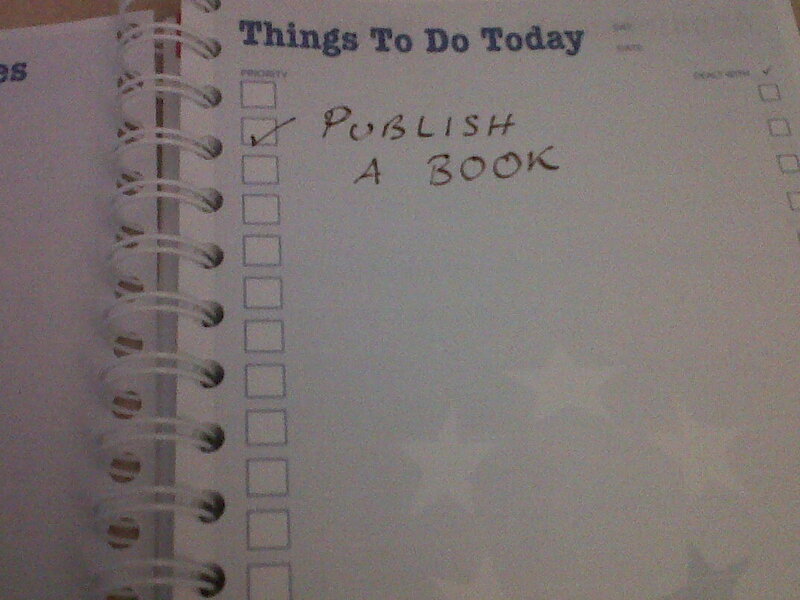 Here we have that marvellous pony book phenomenon, a trilogy! Katy’s living on Exmoor on her Mum and Dad’s farm, but her Granfer still runs the herd of Exmoor ponies, as her Dad was never that interested in the horse side of things. There’s a lot to get used to as Katy grows up, not least of which is coping with school: she’s not that popular, and when a new girl, Alice, starts, and accidentally befriends here, there’s some serious working out to do before they can be true friends. So when Katy spots a tiny new foal on the moor, on her birthday, she knows that all she wants to do is be close to the filly. Classic pony book themes like children bidding at auctions, hidden ponies and that useful stable owner down the road are updated into a world where it’s no good having a mobile phone if you can’t get a signal (but you still want on), you have crushes, your sister lives with someone without being married, and Facebook makes quite a few appearances. It could be an uneasy mix, but it works. Will Katy befriend and tame the foal she’s named Trifle? Will she manage to learn to ride? Read this charming book and find out. Lovely illustrations by Victoria’s husband, Chris, too. Again, we’re reminded very sensibly about the hard work needed to get a pony to the standard needed for showing and general obedience. Katy tries to introduce her pony, Trifle, to the showing arena, but disasters ensue (disasters that are all too real and in fact are based on the author’s own experiences! ); then again, maybe it’s more useful to teach Trifle how to stand still. The female friendship strand is going strong: Alice is going away to school and Katy’s worried that their friendship will grow apart, so then of course it does start to fray until they have it out. Money is tight at home, and in another nod to traditional pony books, which often have an artist or writer Mum or Dad, Katy’s Dad is torn between farming and painting, unable to make a real living out of either. Things begin to look up, but only after one of those PERIL!!! episodes, again looking back to so many horses stuck in quarries / barbed wire / falling when out hunting scenes, but done charmingly and realistically without being too traumatic. Katy doesn’t feel she quite does the right thing, and will it all come out right in the end? Even the “championship” theme is cleverly twisted, which raises a smile. What happens when you want to set your wild pony free again for a run around Exmoor … but she takes one look at being free and runs back home again? This is just one theme in another charming instalment in the Katy story. Katy’s doing well enough with Trifle to go to a residential Pony Club camp (with all the shades of Jill that conjours up: and even though everyone fancies one of the instructors, there is still the cross instructor who will meet her match and plenty of fun detail about the Camp). She’s also negotiating her long-standing crush on a local lad who moves away, their only contact being on Facebook, and dealing with the worry of outgrowing Trifle. But there’s still showing to be done, a mystery about a groom to solve, a baby to come, and the surprise of the title, as well as some great, believeable scenes as Katy and her older brother are trusted to keep an eye on the farm while their parents are away. I have to say, I guessed the surprise quite early on, but it didn’t spoil this great read for me at all. I do love the way that these books constantly take a fond and respectful look back to the pony books that have come before. This makes them readable on different levels: someone young reading them for the first time won’t know about this but will appreciate the modern touches and horsy detail; someone like me, steeped in pony book tradition, will love spotting the themes and nods and the way they are cleverly worked in and slightly subverted. I’m looking forward to (many) more from this lovely author – next up is a new trilogy with that rather rare thing, a boy hero (any nods to Our Ken from Mary O’Hara’s books, I wonder!). My only complaint: couldn’t they be twice as long? 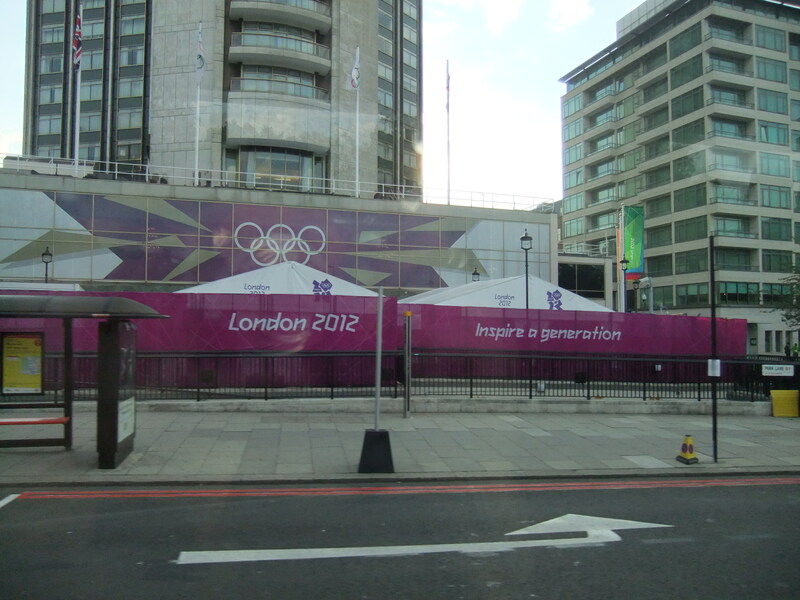 A bit of a late post here – the Olympics got in the way, rather! July was my month of rereading, of course, and so the TBR didn’t go down that much. 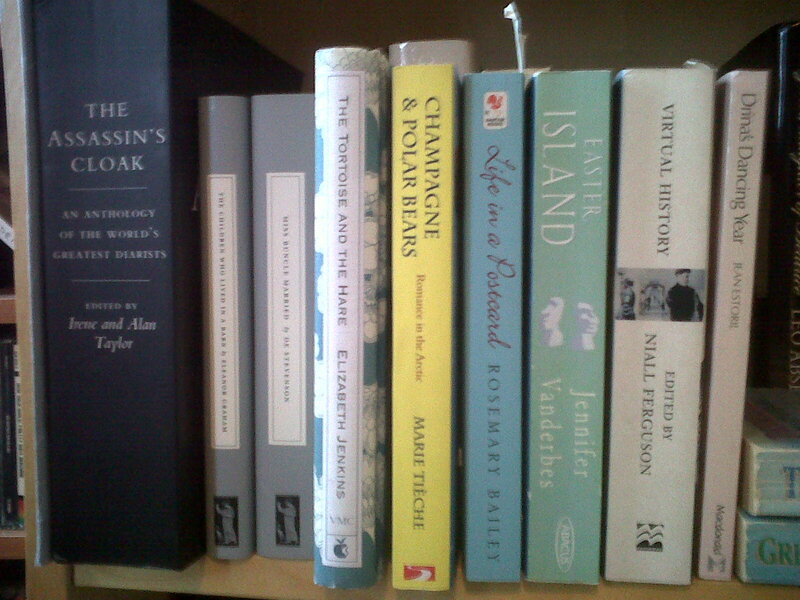 A bit of reading on exercise bikes has got the TBR looking a lot more healthy, and I didn’t do too badly on my Not Adding To The TBR project, either, gaining (OK, as well as three pony books sent for review by the publisher) a mere two books on the back right-hand end of the shelf. Hooray! As for upcoming reading … I haven’t been doing much reading at home, owing to the Olympics taking up every spare moment when I wasn’t working or sleeping, so I have a little slew of Nice Books to attack – two Persephones and a beautiful Virago hardback reissue of Elizabeth Jenkins’ “The Tortoise and the Hare” (which will also count in All Virago All August, too, for the LibraryThing Virago Group). I am reading a great Edward Enfield book right now, and have one pony book to go in the set. I do want to manage a reread this month, which will probably be one of the Mary O’Haras there on the shelf. And once I’ve got through a bit of the Mag Lag downstairs (that’s that pile of unread magazines on subscription that sometimes gets a bit out of control and out of date), then that yummy diary anthology will be joining me at the dinner table. The verdict: a bit chaotic, but I think you get the general idea! What are you enjoying reading this month? And is Mag Lag a feature of your household, too (M just got to the end of 2010 with his Edge Magazines, which might be a record)? 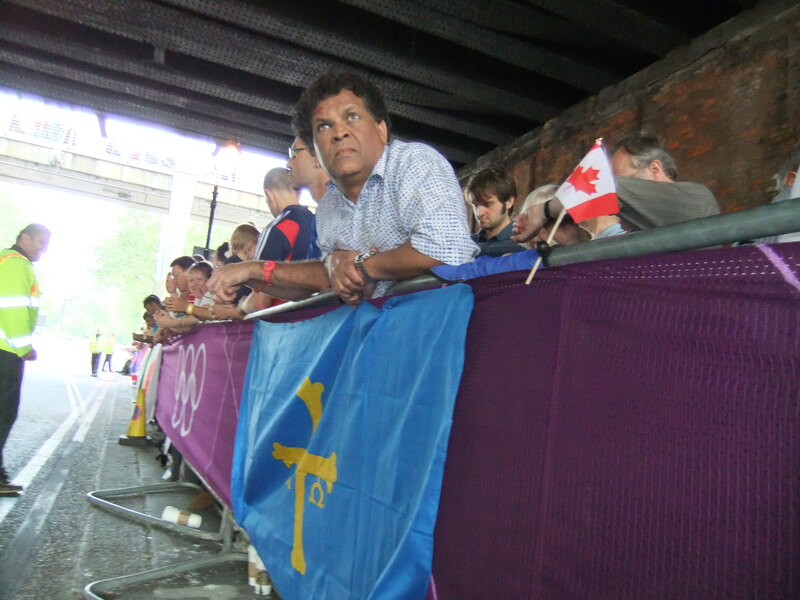 “What does the Olympics have to do with Libro Full Time project?” I hear you cry. Well, did I not say that a) I was going to be taking time off and sharing the fact that I do; b) the aim of working for myself was to be more flexible? Here’s how this has worked in practice. 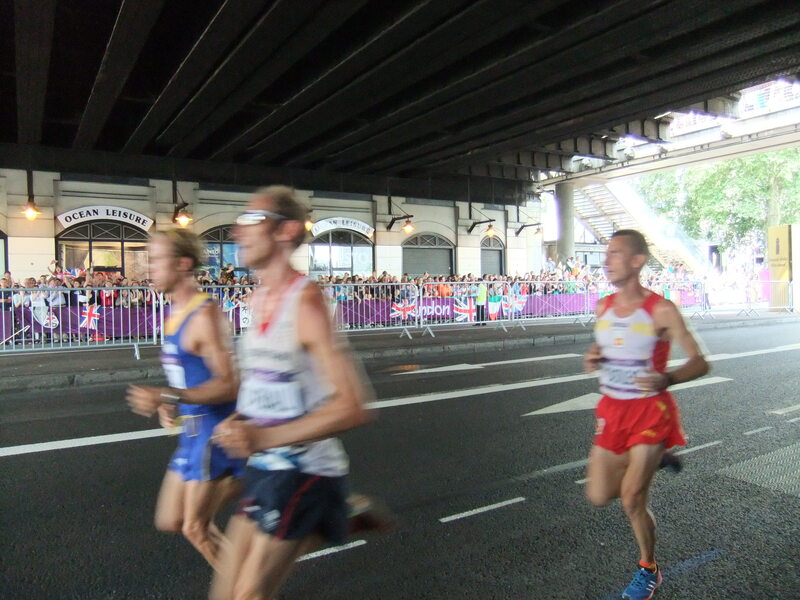 I’ve spent the past two weeks working around my Olympic TV viewing. I told my regulars about this plan a couple of months ago, and reminded them more recently. They were told that I would do their work, but it might take a little longer and I might take a little longer to reply to emails. I installed myself on the sofa with my laptop beside me, and managed to work mostly in the early mornings. I did 34 hours the first week (oops) but 17 the second, and managed to see everything I wanted to see. 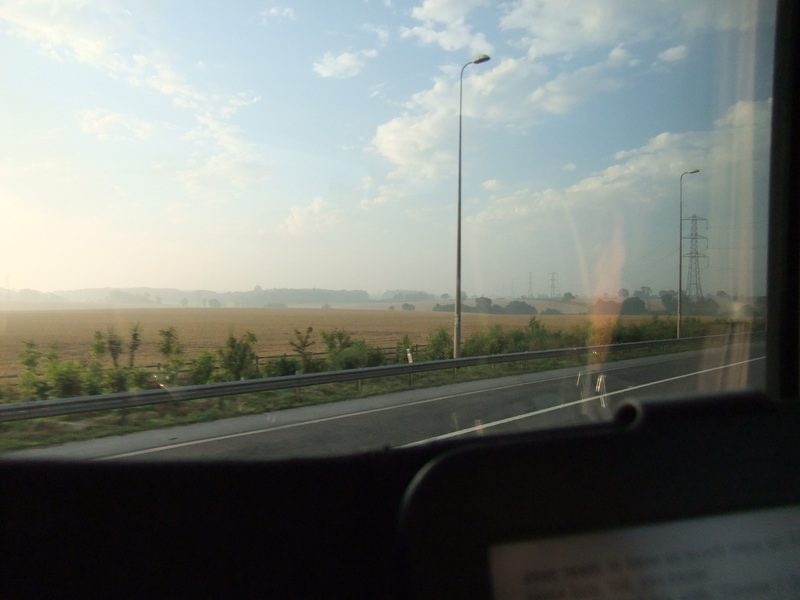 We drove through the dawn; I had meant to sleep but instead watched the sunrise then read a book on my Kindle. The weather and scenery were very pretty. 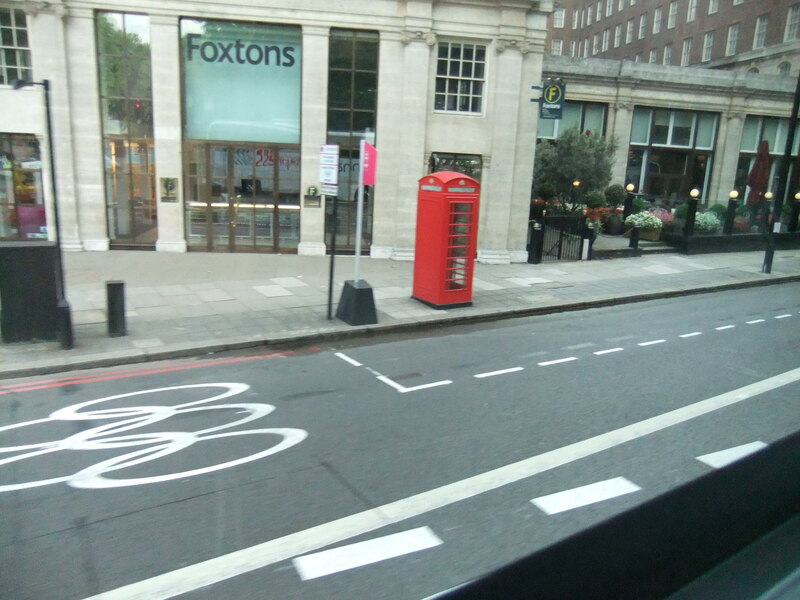 And as we reached central London, I spotted Olympic traffic lanes and bus stop signs. 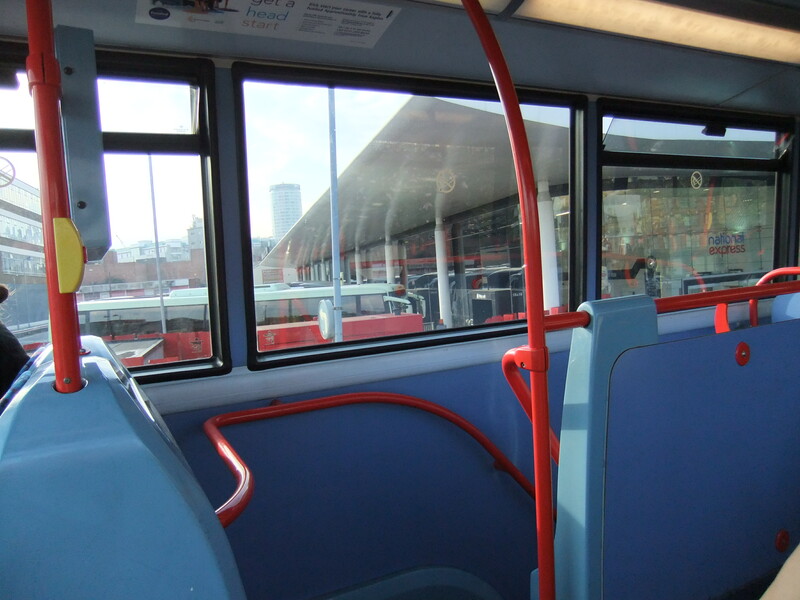 We got into Victoria at about 7:40. 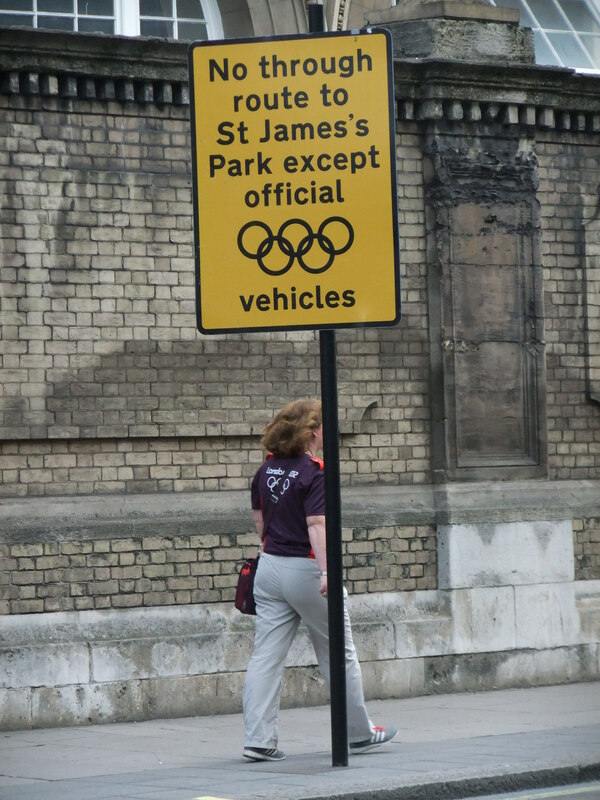 I walked up to St James’ Park, noticing more directional signage and the odd Gamesmaker along the way. 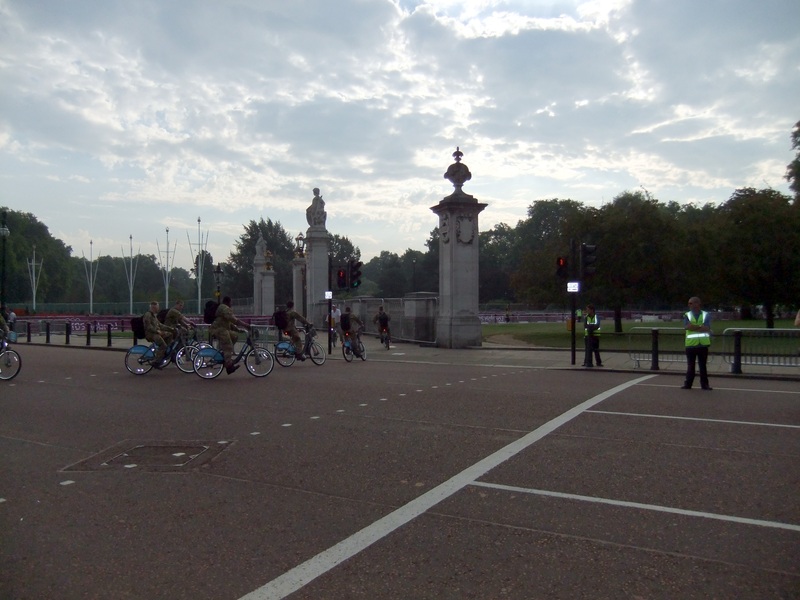 Up by Buckingham Palace I spotted the Army resplendent on their Boris bikes! 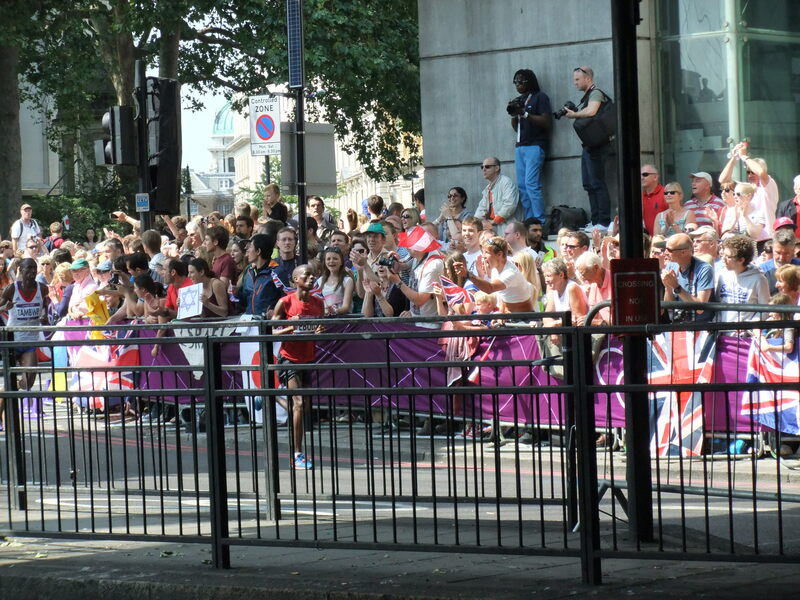 … but there was a great atmosphere which continued as I made my way down the side of the park. 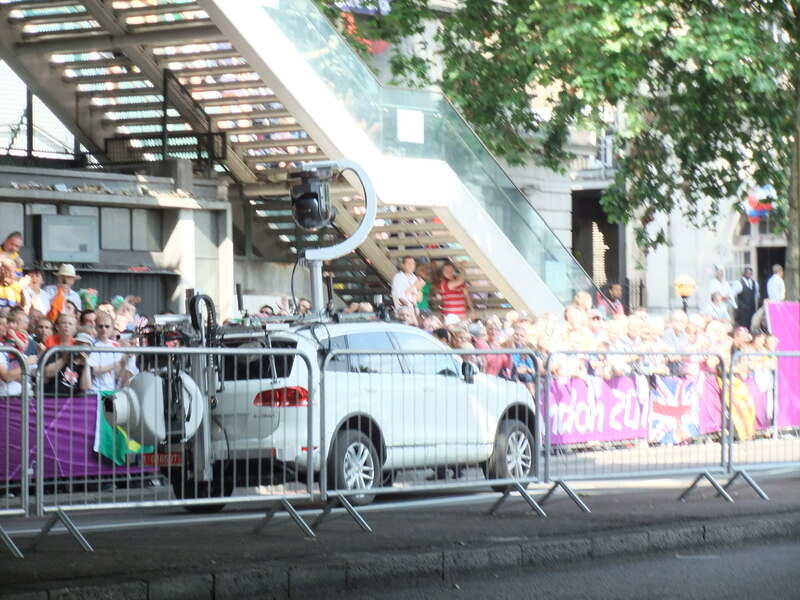 I loved seeing the runners taking a sneaky detour down the marathon route! 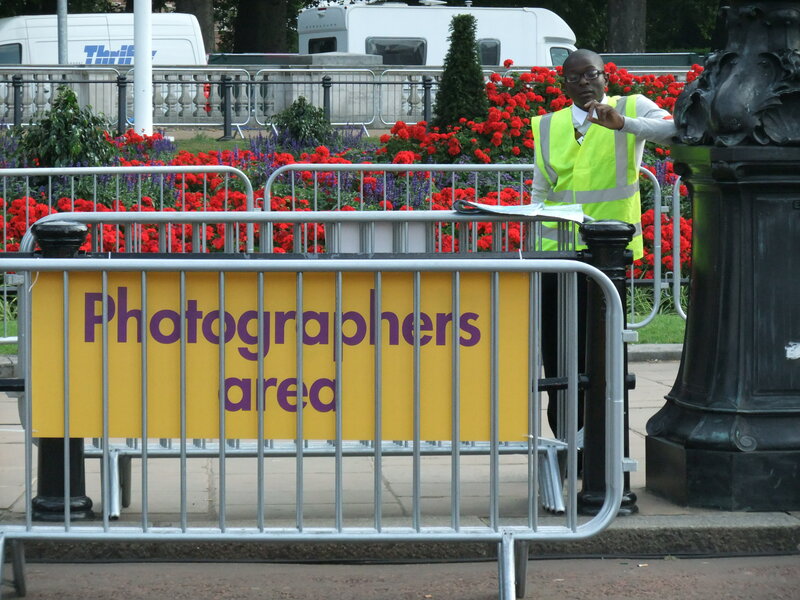 And everyone was smiling – police officers, marshalls, other members of the public. I took a few photos of tourists with their cameras! 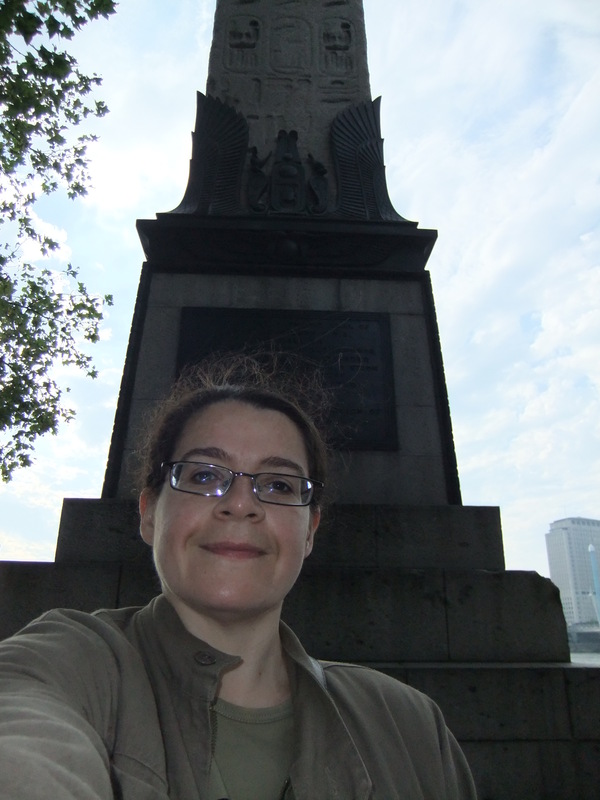 but it was getting sunny already and, after snapping a self-portrait at Cleopatra’s Needle (Matthew and I used to like walking there in our courting days) I headed back for the bridge. 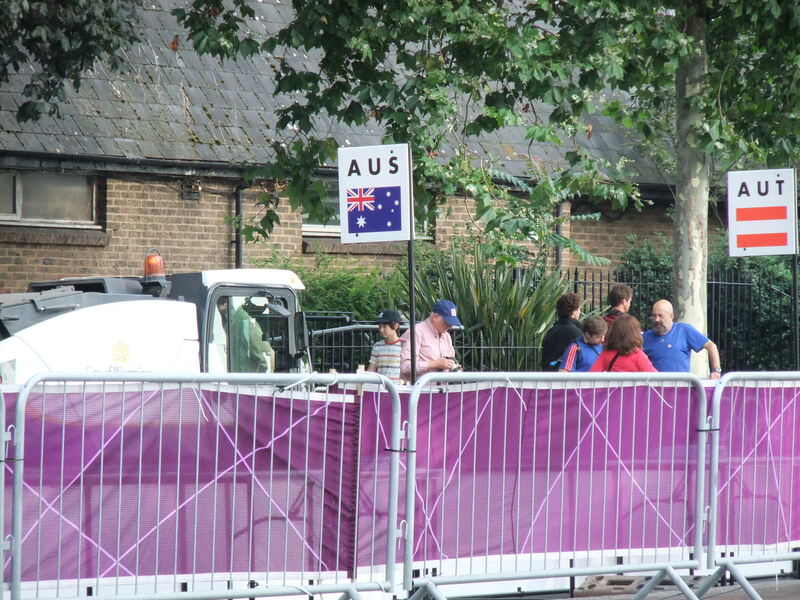 … watching the Canadian man next to us fashion a chair out of a traffic cone and some cardboard, and the marshal helping a chap pin his Basque flag to the railings (the Basque chap was reading Kate Fox’s “Watching the English” – a nice touch). The marshals gathered to have their debrief, then spread out around the course. The crowd built on the opposite side and ours, too, I had a sneaky bun, as breakfast was seeming far in the past, and then they were off! 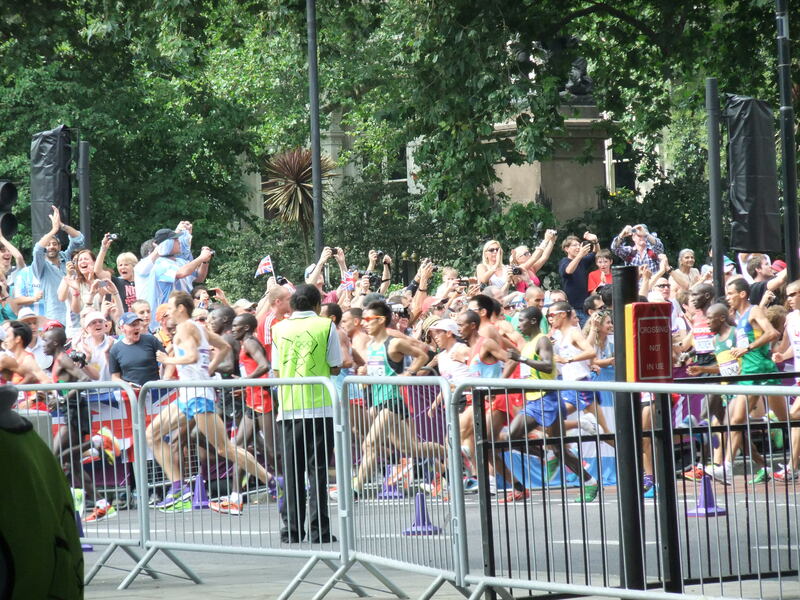 Then the first runners whizzed around the corner. 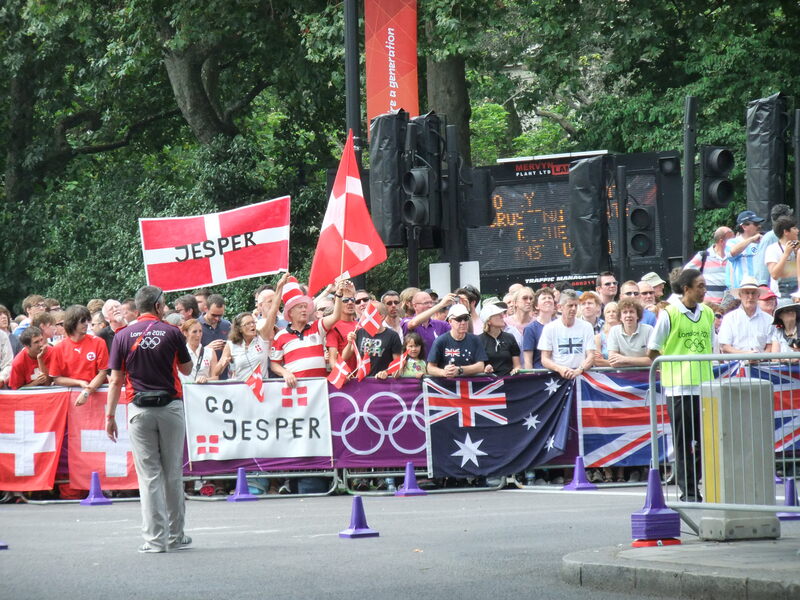 The “Go Jesper” signs built up on the other side, and we always looked out for the Danish runner as he came past and gave him a special cheer. A few minutes, and they were round again. 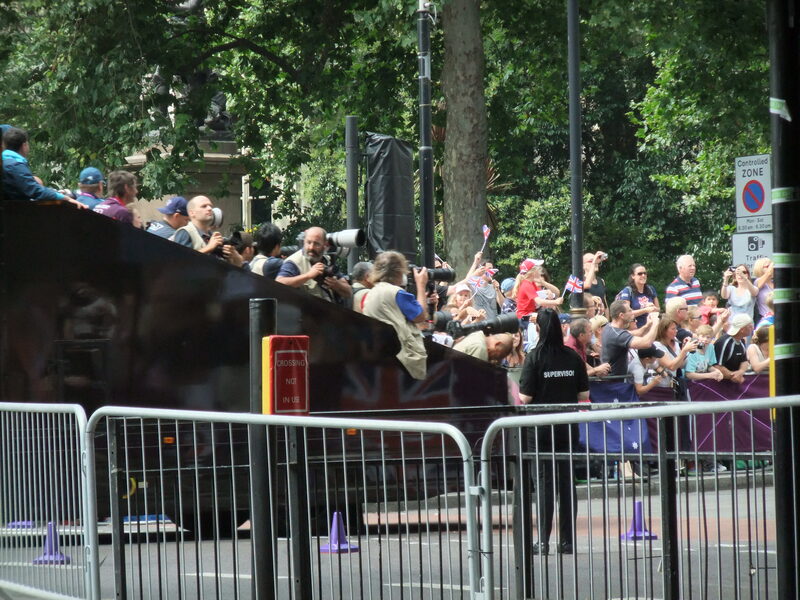 The Gamesmakers had quickly and efficiently moved the mini cones, so the route was clear, and here they came, along the other side of the road, heading for the City. 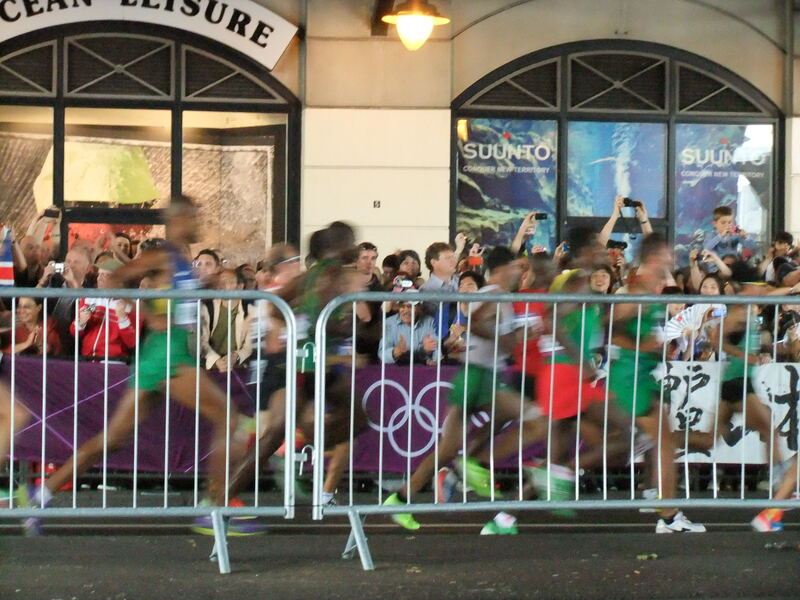 Yes, it’s blurry … but they were going fast! 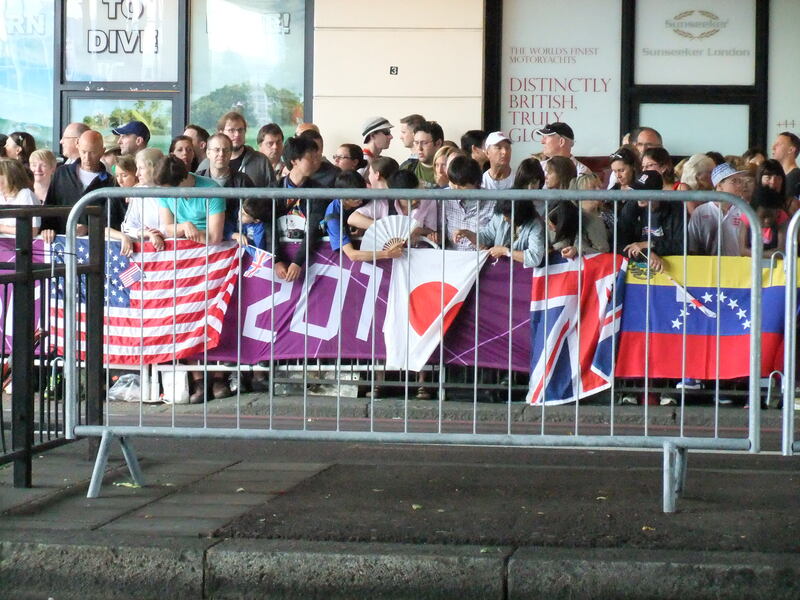 And then the longest wait while the race was actually on, as they went round the city and came back down our side. 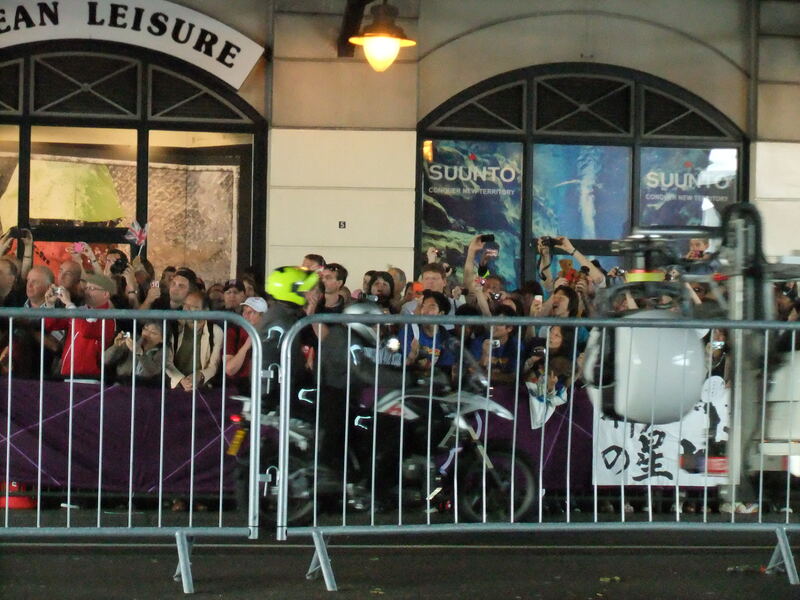 The TV footage shows them doing all manner of exciting things like running through Leadenhall Market. 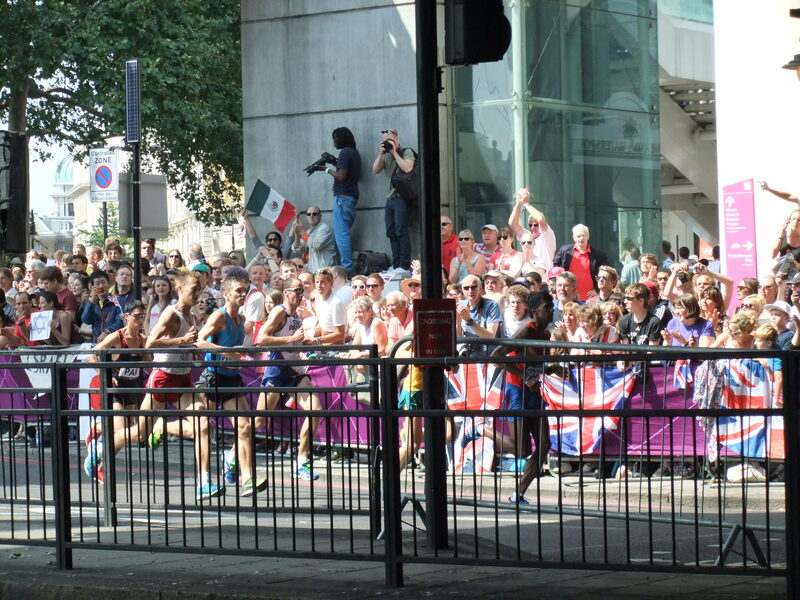 The marshalls were great here, organising Mexican Wave competitions between the two sides of the road. Then they were back! 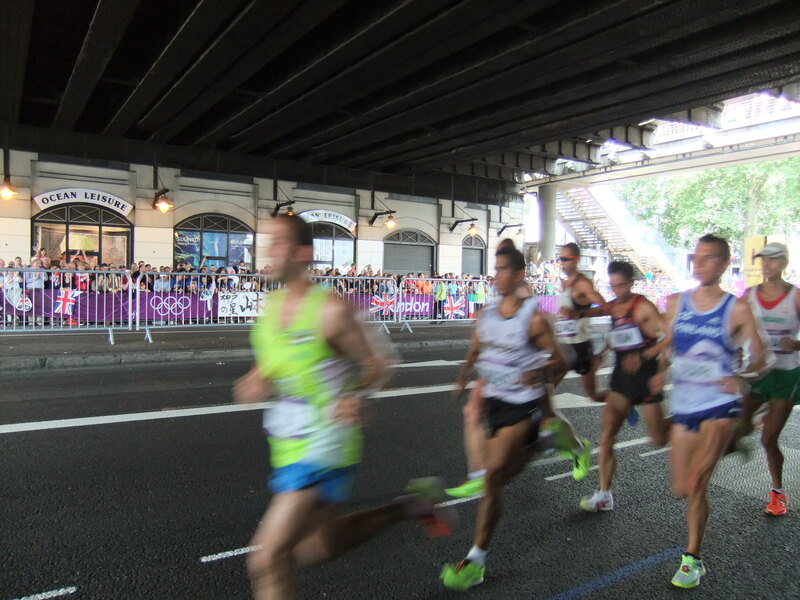 Whizzing past us as we screamed ourselves hoarse for every single runner. They were concentrating, but I bet they could hear us (I hope they could!). They were already quite strung out, with the elite Kenyans and the eventual winner, Kiprotich from Uganda, at the front, favourite, Mutai, a little way back, our plucky chaps a bit further back (and yes, I found myself screaming even louder for them) and then the rest of the field, still elite, the best in their country … but coming last in a small field like this is very obvious. But do you know what? 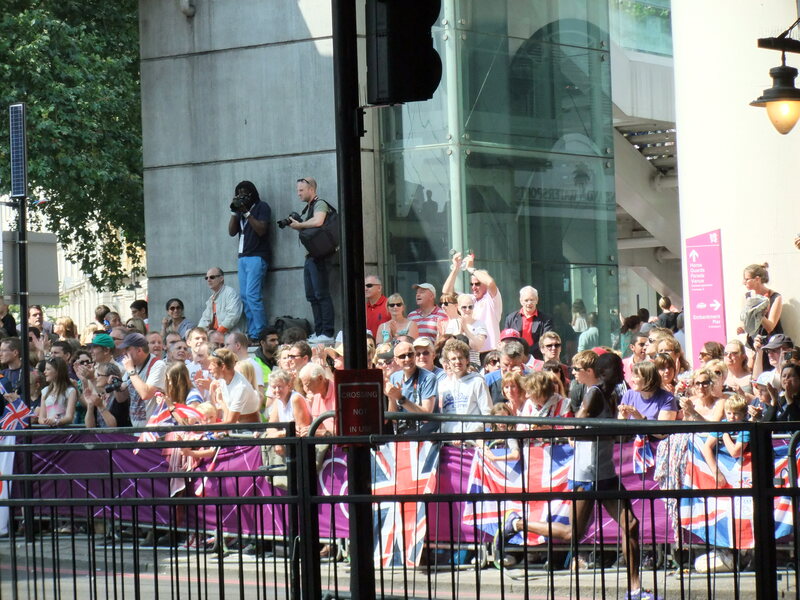 The crowd cheered more loudly for those at the back than for anyone else. I cheered for my compatriots, for people from countries where I have clients, like Russia, Finland and Poland, for those where I have friends, like Australia and, for those where I love the country – fitting in Tunisia – and everyone else! It was amazing. The pics with them running to the left used no zoom. We could have reached out and touched them. It was astounding, beautiful, and so heartwarming. I did manage not to cry too much. 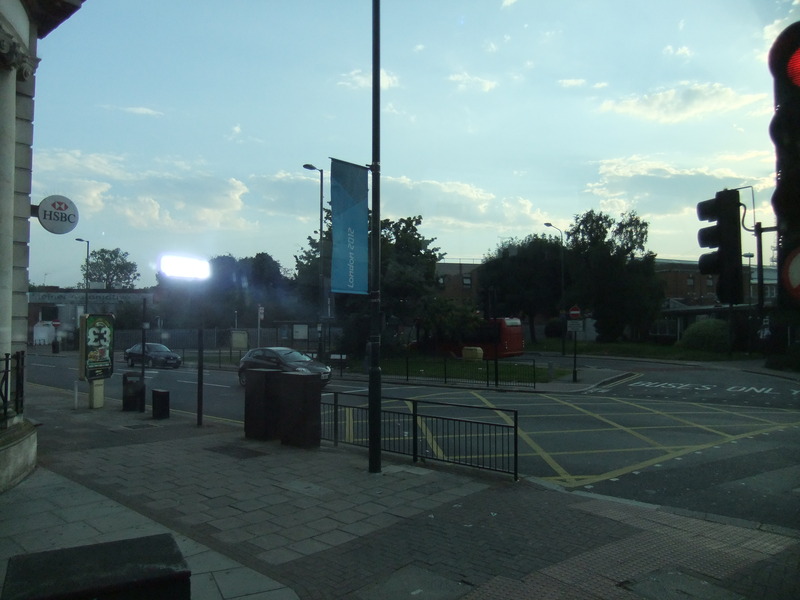 I took one more set of photos as they came back round, which came out quite well. Then I put the camera away and just enjoyed the moment. The countries. The battles. The striving. 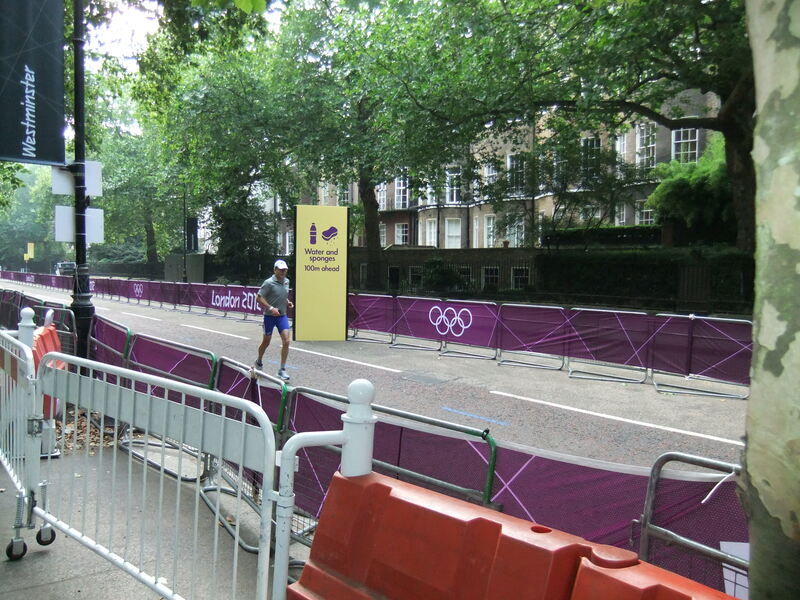 The Greek guy who waved and smiled as he did his last lap, and got an even bigger cheer. 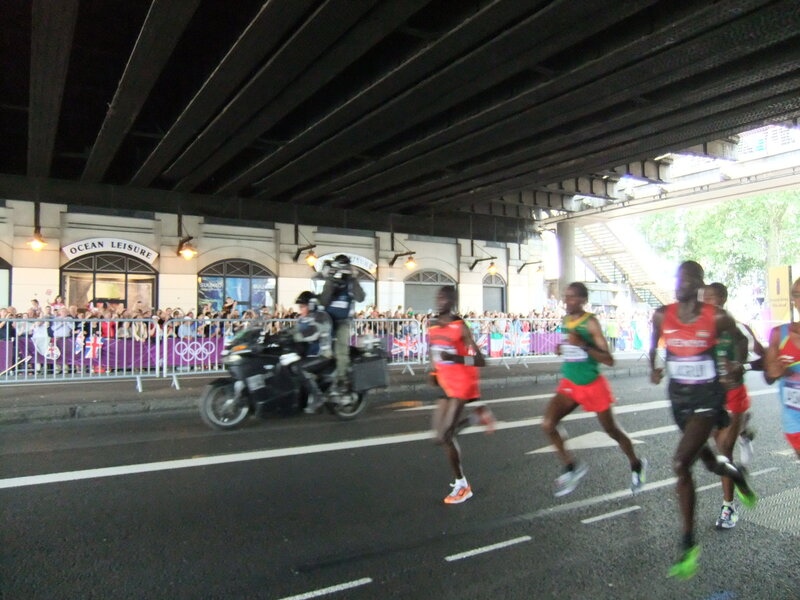 They went up and back past us three times in total, so we saw the runners seven times. 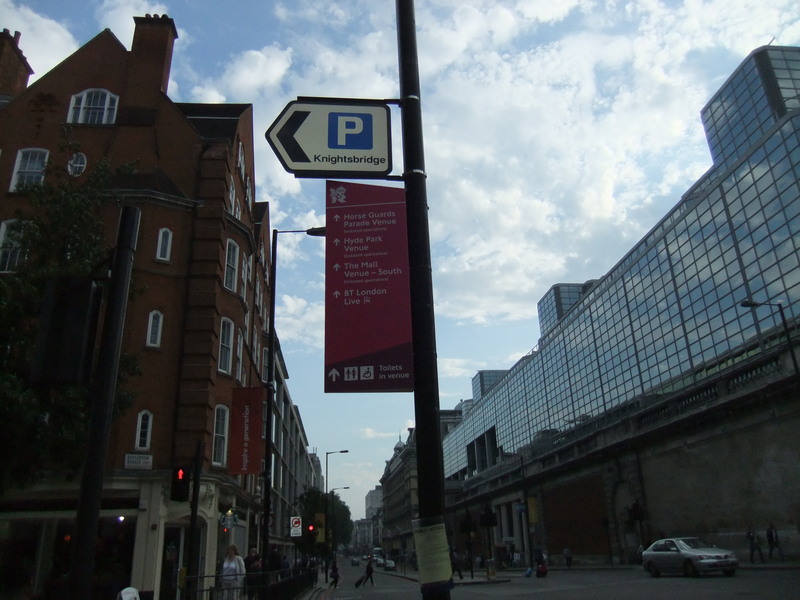 Thank you, Trafalgar Square Gamesmaker! And we watched them to the end. Well, we thought Timor Leste was at the end, but then as I said goodbye to my new friends (the German girl was off to the Modern Pentathlon for the afternoon), I realised that the chap from Lesotho was still going, so stopped to cheer him, and to take a picture of a marshal who’s been in the country for a year and a Dutch tourist who had made friends. 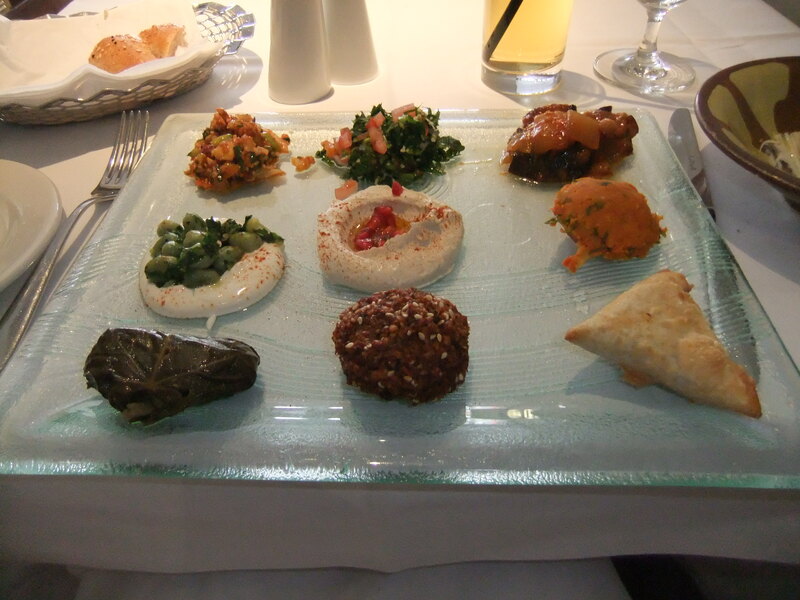 I then walked east until I got up onto the Strand and popped in on a favourite restaurant, Sofra, for lunch. 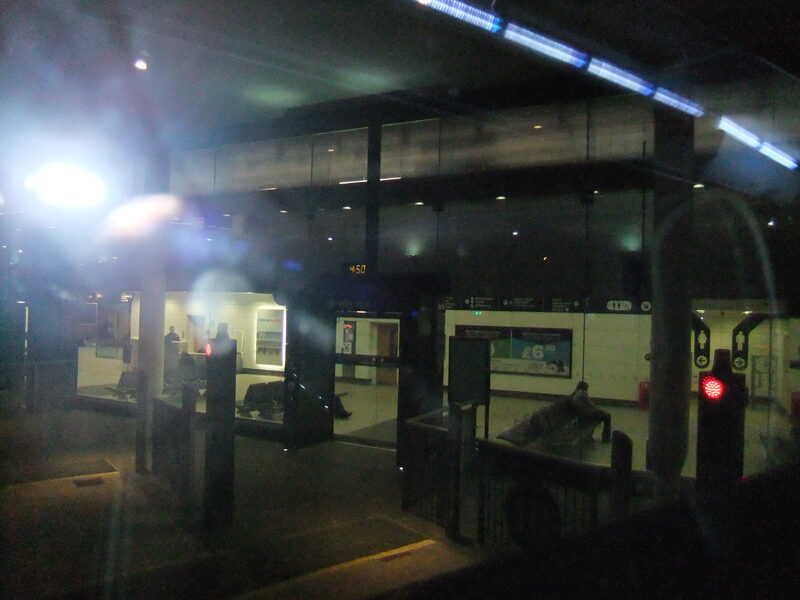 Then it was time to walk to Charing Cross and get the Bakerloo line to Marylebone. 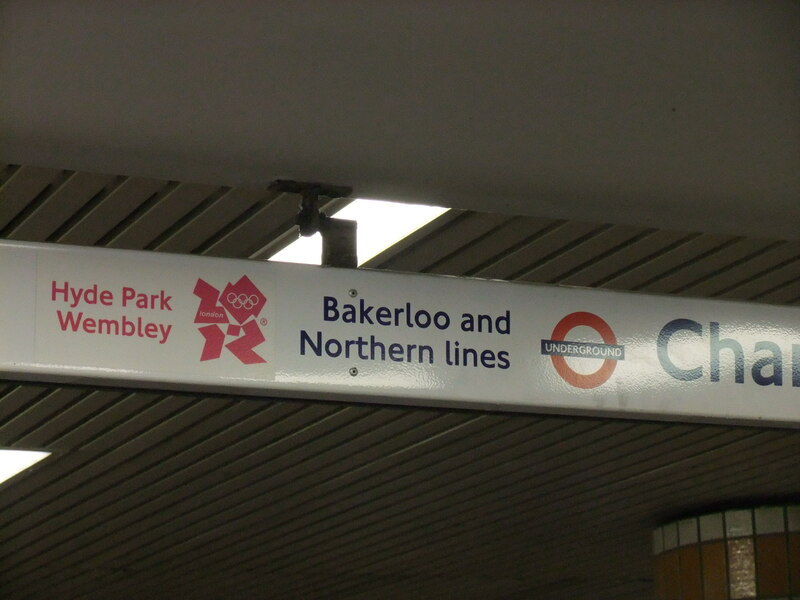 Even on the Tube, there were directions and signs. I got to Marylebone in good time for my 16:00 train. 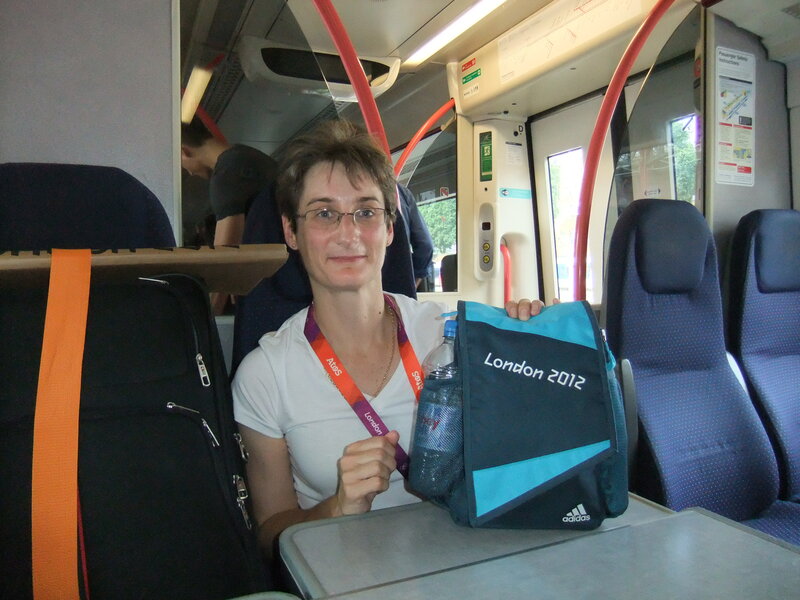 And I couldn’t help chatting to a Gamesmaker who sat down beside me. 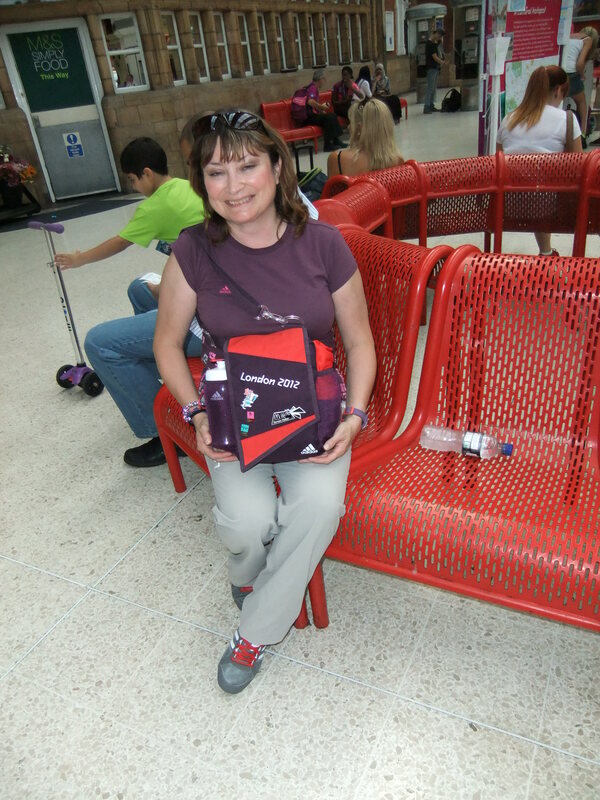 Yvette had been doing action replays for the Taekwondo, and was off to the Paralympics to do IT, too. I thanked her, as I tried to thank all the Gamesmakers I came across, who were unfailingly cheery and polite, and took her photo, with permission. A perfect end to a wonderful day, I thought. But there’s more! 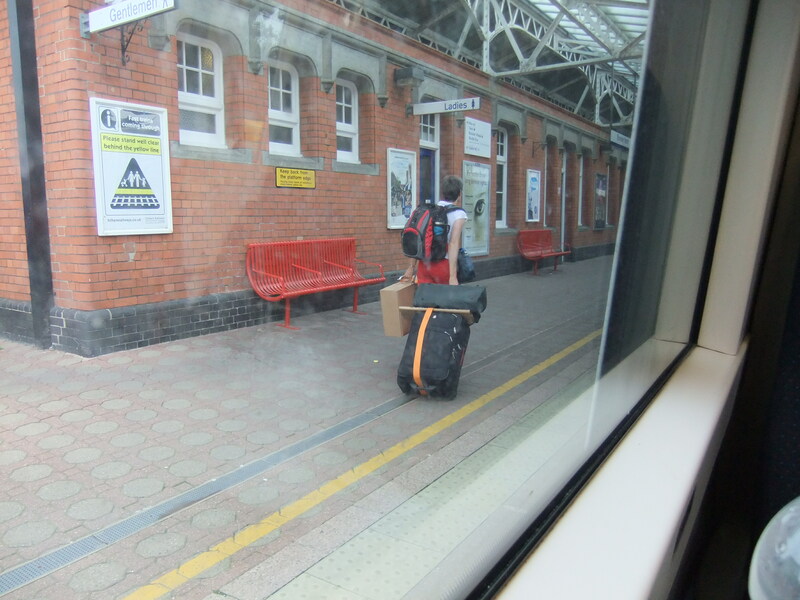 My train was announced, and I headed for the platform, only to see a lady walking along with an Olympic-branded box and a large case. Drawing up alongside her I realised it was my old University friend, Alison, who is a qualified track judge and had spent the previous week and a half in the photo finish booth at the main stadium. I can honestly say that this was one of the best days of my life. 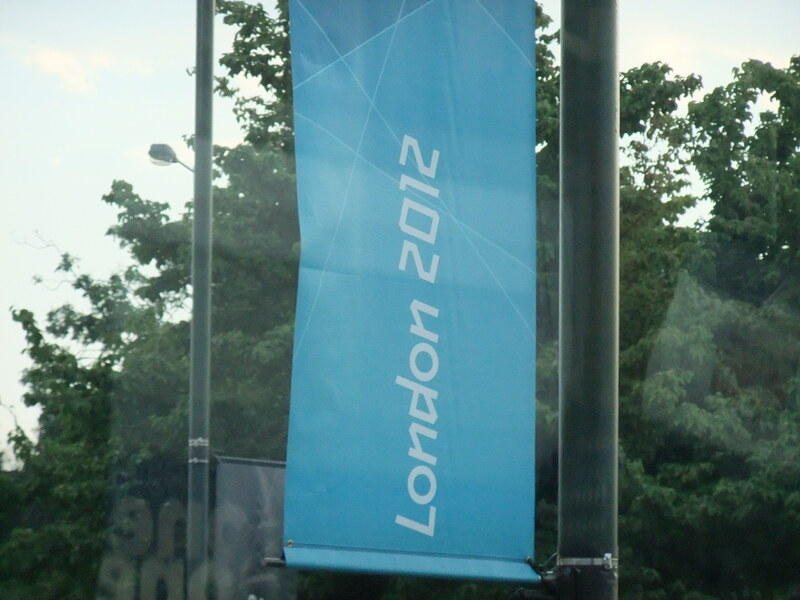 London was amazing – very un-Londony, relaxed, friendly and smiling. I am so glad I experienced the Games for myself and at an event I love already, and for free! 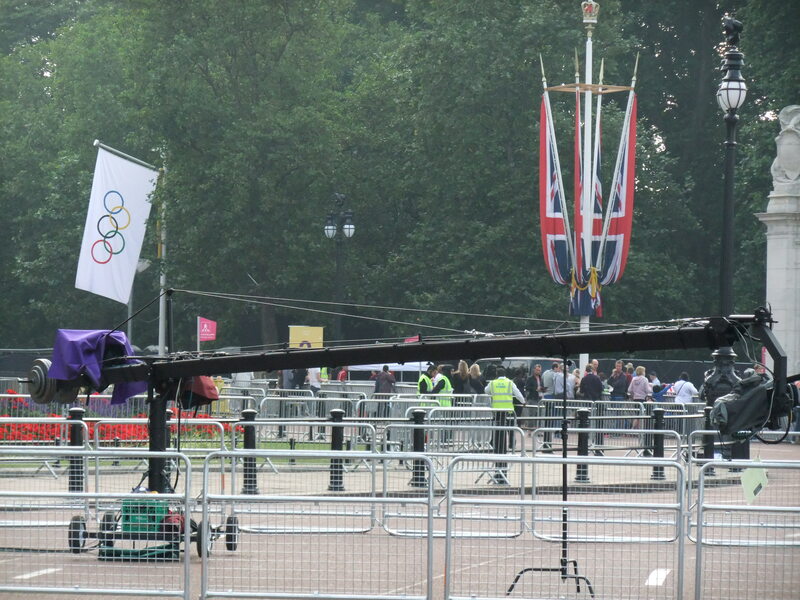 I watched some of it back on the TV then the closing ceremony with all its patchiness, but it was still an experience shared with much of the rest of the nation and much of it brought a tear to my eye, especially the thanks to the volunteers. 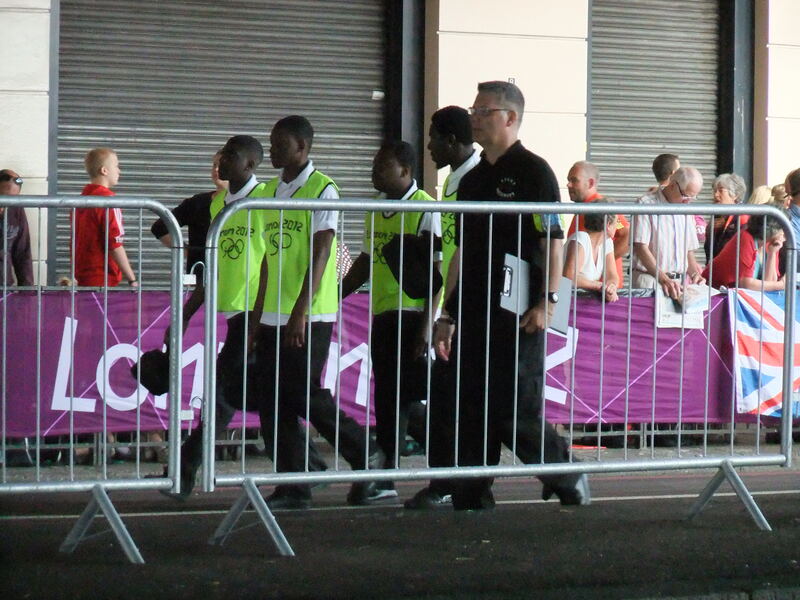 Well done, Seb Coe, well done Gamesmakers and track judges, and thank you for an amazing experience. And here are my final three book reviews from the Month of Rereading! I went off the list (well, I’d read everything except “Green Grass of Wyoming” and “Thunderhead”) and picked out some non-fiction that I’ve wanted to reread for some time. Unfortunately, I have a policy of only keeping books I want to reread, Bookcrossing all the others, so I had a potential choice among all the books downstairs in the house … but these are ones I’ve had my eye on for a while! I selected this with great excitement, as I remembered a jolly read about the two young poets touring Iceland in the 1930s. Unfortunately, there is less straight narrative than there is clever poetry and a rather odd section written as if by a jolly school marm type on a trip abroad. It does mention some of the older books I’ve read by intrepid women explorers of the country, but it was of rather more limited appeal than those. My first disappointment, though! One of those books you read at the time and always mean to reread. It’s still a good and interesting book, talking about the way trends spread, like epidemics. Having read his other books, in fact, I’d say this was the best. It’s full of his trademark varied examples, told vividly and drawn from all walks of life, and an engaging writing style. It hasn’t dated. Interestingly, I’d thought for years that I was a Connector, but actually I’m a Maven. I don’t create trends, I don’t have an enormous social circle, but I do know about stuff and enjoy recommending stuff (and people) to people. It was a bonus to work that out, and just goes to show that you don’t remember all the details of non-fiction books either! A worthwhile reread. I recall buying this as soon as it came out in paperback, loving it at the time, and starting to call myself a “cybrarian” (what can I say: I was at Library School at the time). This book was written just as the digital revolution was starting off. As a point of comparison, at this stage I had my own email account, had text-only internet access at University, and was a member of a few listservs. Negroponte was at the MIT Media Lab, working on cutting edge technology. In this book, he set out his stall as to the uses of the digital features that were just then being developed, and predicted the near and far future. This book had a big effect on me, helping me embrace “digital” more in a world where library studies were being pulled in two directions. I guessed it would be a very different reading experience now, and so it was. But fascinating! So, what didn’t happen? Negroponte’s computers-in-a-watch … well, that is not ubiquitous, but the computers in our mobile phones are analogous, I think. And we still don’t have nine-inch hologram personal assistants running around on our actual desktops (what a shame – although mine would trip over the piles of paper and books on my desk!). And I think CD-Roms probably disappeared a bit more quickly than he thought. He predicted ebooks, but thought they would be on actual paper, and predicted newspapers in that format, too (also, oddly, I recall distinctly reading about e-ink that switched round to present new words on flexible pages when a chip was inserted into an ebook spine. Couldn’t find that in the book this time, even after going through the index. I wonder if I read that in an article he wrote). And the iPad – “multimedia will become more book-like, something with which you can curl up in bed”. He accurately predicted in-car GPS systems, although doubted that they would have voice commands, owing to the fear of litigation (they do have voice commands in the US, right?). And the most important one, to my mind, was his prediction of borderless, 24-hour working. That’s certainly come true for me! What’s changed? Remember dial-up? It was amazing in 1996 to have a list of numbers allowing you to connect to the Net from any country in the world. Yes, a list of phone numbers, and 90 different phone jacks with which to connect your computer in different countries. Hotel guides were starting to publish information on which chains didn’t allow you to unplug their phones and plug in your modems! That feels like another world, doesn’t it! And what hasn’t changed. Amusingly, he talks about people claiming they are not “computer literate” after the “debilitating” battle to print a document off. 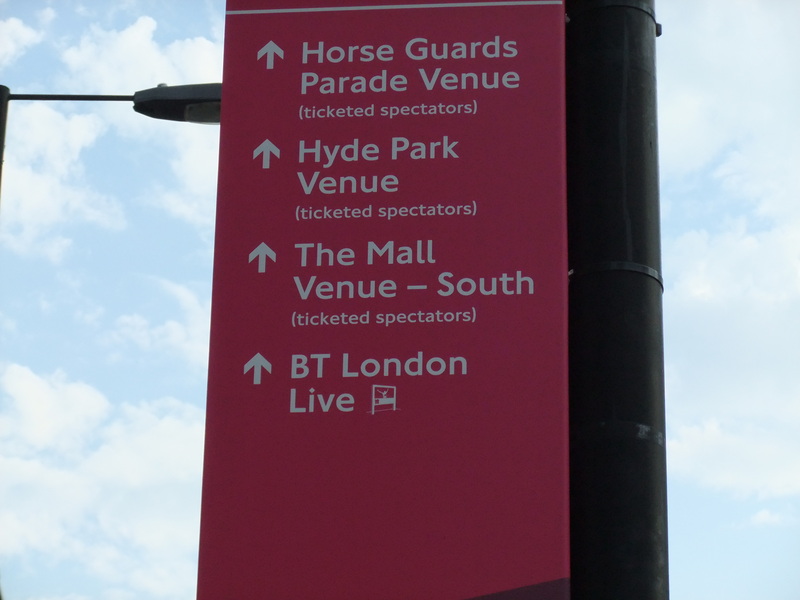 Well, has that really changed … ?! It was truly fascinating to read this from the other side of the digital revolution, and I am so glad I did so. So, that’s it. Twelve books reread: nine fiction and three non-fiction (plus two new reads: one on the Olympics and one sent to me by the publisher). I have to say that I’ve loved this. Diving into beloved classics, curling up with cosy comfort reads, finding more than I expected, and only one disappointment. I would certainly like to do this again for a whole month, but I also think I will weave some rereading into my everyday reading life. What’s the point of this endless treadmill of new books if you can’t go and savour some older ones, too? 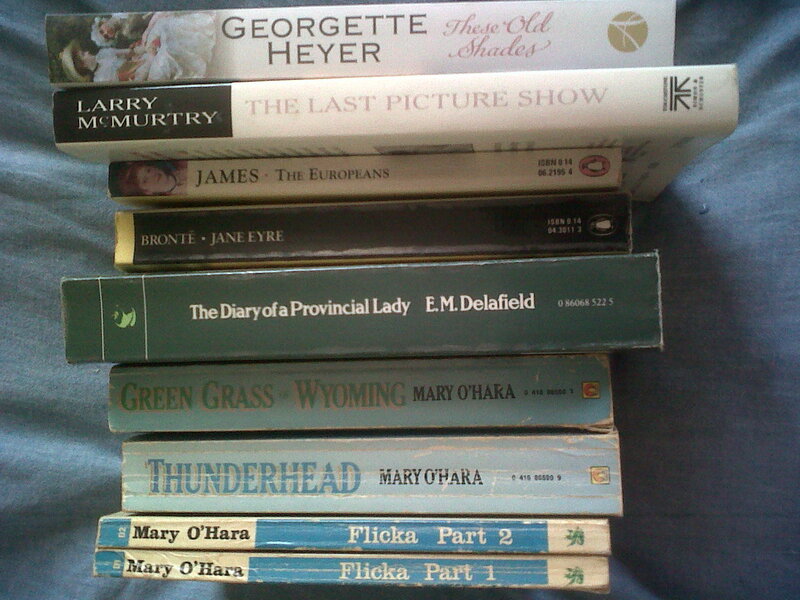 I’m going to start with the remaining Mary O’Haras and the rest of the Larry McMurtry Thalia series, and who knows after that. 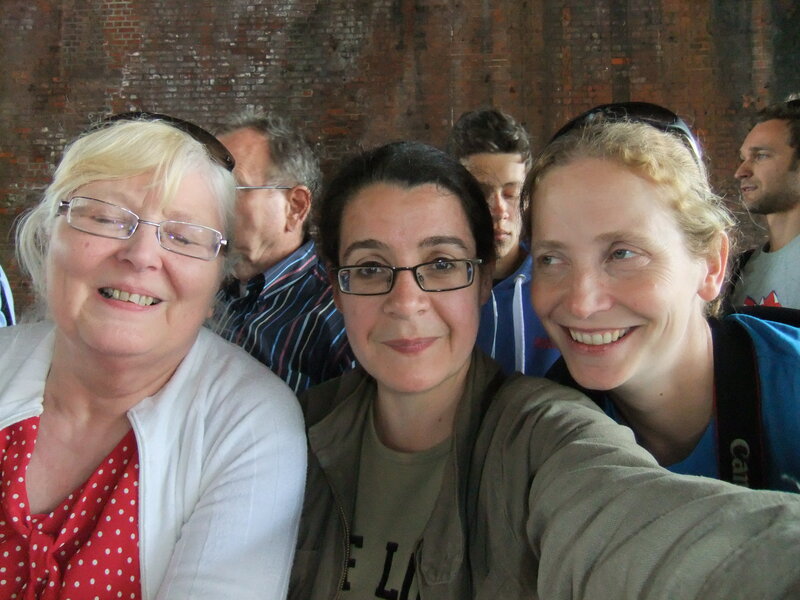 Thanks to Ali for co-hosting this month and for all her blog posts and encouragement. I’ve really enjoyed reading about her and others’ reading matter during July, too!